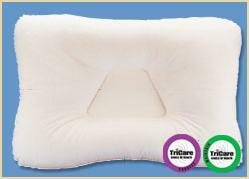 The Tri-Core Cervical Pillow's unique trapezoid center gently cradles your head and supports the neck in its natural position to help alleviate the pain that accompanies numerous maladies. Premium Fortrel Bactishield fiber combats growth of bacteria while providing lasting freshness. Three size options provide comfort for children and young teens, as well as smaller- and average-size adults. The Tri-Core is the #1 fiber support pillow recommended by the medical professionals who most commonly treat neck and head pain. The Tri-Core fits a standard-sized pillowcase; Standard version features a white 100% cotton cover; Excel version, a cotton-blend, blue and white cloud print. The Jungle Print (or white) Petite Core, for children and small adults. 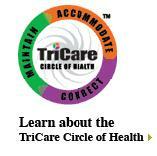 The Tri-Core and Mid-Core also come in a Standard (firm) and Gentle options.